Platanias is an attractive village on the island of Crete, approximately 10km to the west of the city of Chania. This seaside town boasts a fabulous beach, which stretches from the east of the village to the west. 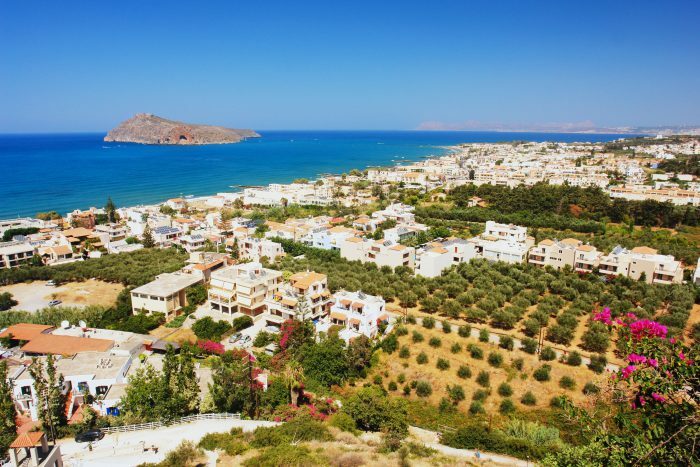 Whilst an inherently relaxing and tranquil coastal town, Platanias has plenty to do to keep children of all ages entertained. Platanias Beach is a great spot to spend the day with the family, whatever age of children you have. This sandy Blue Flag beach stretches for approximately 2km and has a shoreline that gently shelves into the water, making it a safe choice of beach for little ones. For older children and difficult-to-please teenagers, the choppy waters further out to sea makes it a great place for windsurfing and other exciting water sport activities. Asides from swimming or taking part in exhilarating water sport activities, families can enjoy playing golf at the town’s mini golf course. For music-loving families why not visit the popular Sampajana Jazz Festival – aka, the Jazz Fest? This annual event is held over four nights in June in the beguiling Venetian harbour of Chania, not far from Platanias. As well as jazz artists, the festival attracts musicians and fans of other genres, including swing, funk and even gypsy folk, making it the perfect festival to introduce youngsters to diverse genres of music. The city of Chania is just a 20-minute drive from Platanias, where you can enjoy meandering along the old town’s quaint, cobbled streets. Children will adore gazing at the colourful waterside buildings that line the town’s huge Venetian harbour, before tucking into a mouth-watering ice-cream, served in abundance in the many cafes, restaurants and kiosks Chania is home to.